A taxi driver lost control of his vehicle and crashed into a row of parked motorcycles and a car at a carpark in Jalan Kukoh this morning (Mar 6). Stomper Luke alerted Stomp to the incident and shared photos of the aftermath at around 8.59am. In the photos, the taxi had mounted the curb and several motorcycles were seen toppled over. "An uncle told me that the driver had lost control of his vehicle," he said. "He said that he had accidentally stepped on the accelerator." Stomp understands that the cabby had intended to reverse but had accidentally stepped on the accelerator while it was in forward gear. Luke added that the driver appeared to still be in shock after Traffic Police (TP) officers had arrived at the scene. 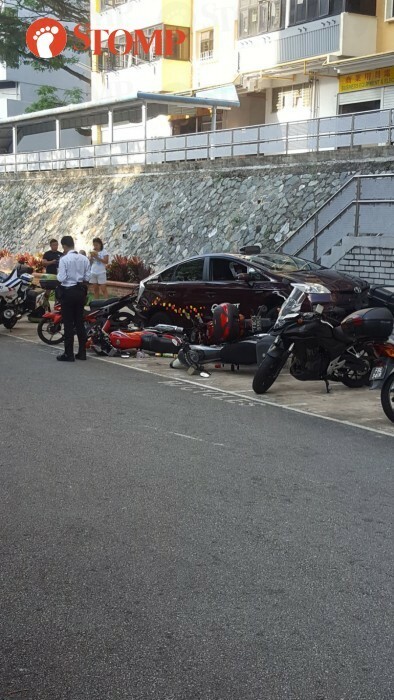 In response to a Stomp media query, a police spokesman said that they were alerted to an accident involving a taxi, a car and seven motorcycles at the open space carpark of Block 1 Jalan Kukoh at 7.25am today.